Let’s take a look at the above inputs and outputs. 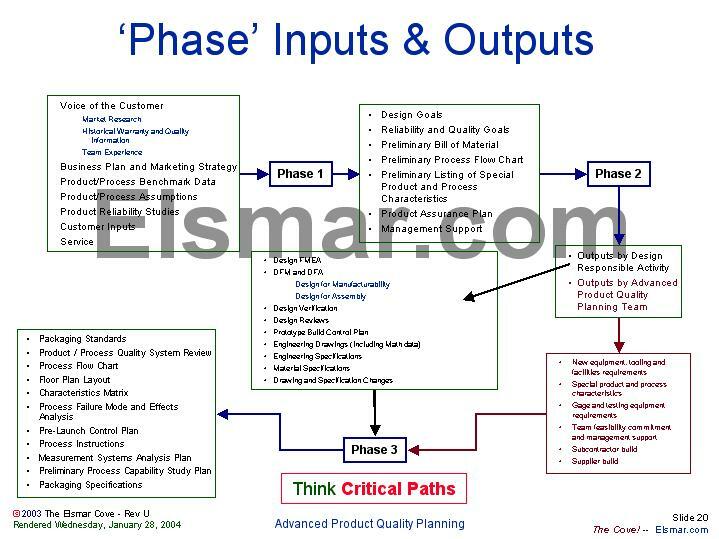 Remember that the outputs from one stage are necessarily inputs to the next phase. That does not mean that in your company you will be able to look at the APQP and Control Plan manual requirements and immediately be able to literally translate the requirements. An example would be the characteristics matrix. Some companies do not have a discreet, stand alone characteristics matrix. So when you are reading through the APQP and Control Plan manual and you come to a place where it refers to a characteristics matrix you have to look at where your company documents critical / special characteristics. When looking at the inputs and outputs one has to use their understanding of how their company systems are set up. Design goals are an output of Phase 1. What inputs will determine, at least in part, the design goals are mixed. You would probably use various inputs from the customer, including Voice of the Customer, and the Business Plan (to name a couple of information inputs for determining design goals). Reliability (MTBF) may a design characteristic goal. Some are relatively evident. Some may not be so evident. Let us again step back and remember that the lists of inputs and outputs may contain ‘requirements’ not applicable to your product. An example is DFA. Although listed as an output from Phase 2 in the manual, your company may not do DFA.